When I was young my grandfather used to make wooden butterflies. We would paint them and he would proudly display them outside of his home. It was nothing but grandfatherly pride that resulted in them being displayed. 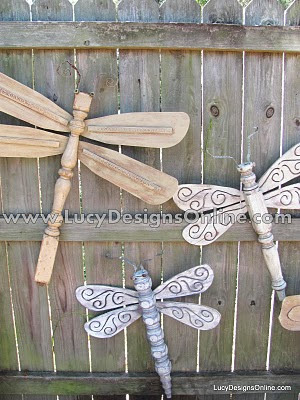 Our works of art were nowhere near as lovely as these gorgeous dragonflies from Lucy Designs. And although one day I will make wooden butterflies for my children to paint and I will proudly display them in my backyard, I wouldn't mind having some of these beautiful dragonflies to display next to them. 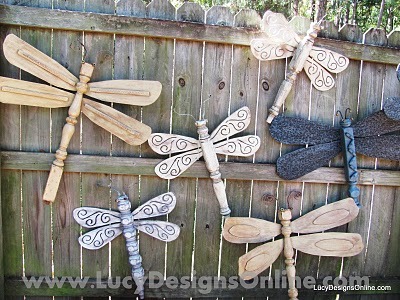 You can read more about how to reuse old table legs and ceiling fan blades to create these beautiful dragonflies HERE. What a truly lovely and creative idea. Would love to see a photo of the wooden butterflies made with your grandfather too. Aren't those amazing? I love them! I'll have to go check out her site. You must have gotten a lot of your creativity and originality from your grandfather! thank you for the feature! that was a nice surprise! wow these are super cute! I love repurposing things too, what a creative idea. How creative. I have a junk table I was able ready to take to the thrift store. I may have to use it for this instead. I'm sleepy, but still commenting because I really want to hang out with you!